Brexit just put Japan in an uncomfortable position. In the immediate market reaction to the Brexit vote, the yen rocketed higher against the dollar and the pound as investors pulled into the safe-haven currency. The yen has reversed some of its gains over the last few days, but it’s now up about 19% against the dollar for the year, currently hovering around 102.78. 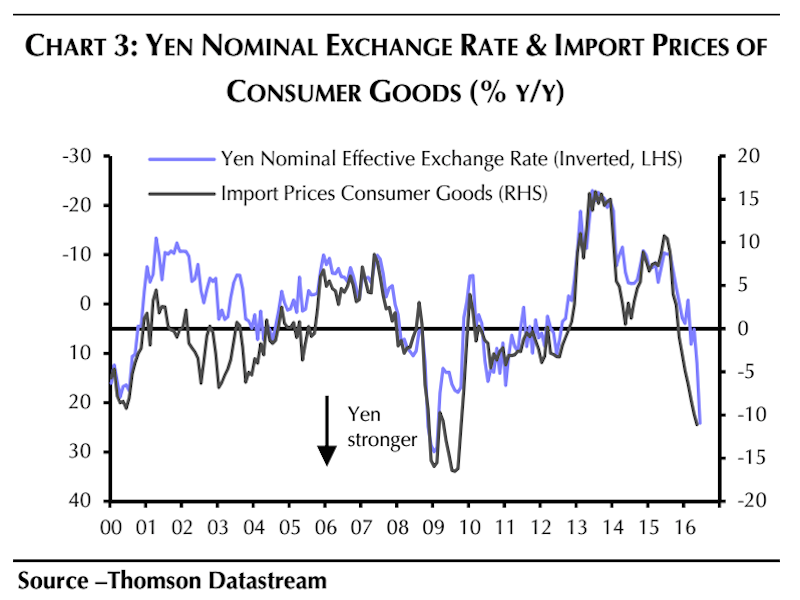 And this stronger yen environment could create problems for the Japanese government and central bank, both of which have been struggling to jump-start the economy via the ambitious Abenomics plan. “…a stronger currency creates a headwind for the Bank of Japan’s efforts to boost inflation,” explained Capital Economics’ chief Asia economist Mark Williams and Senior Japan economist Marcel Thieliant in a note to clients on Monday. In light of this, some analysts now think that the Bank of Japan could ease at their next meeting — or could even try to directly intervene in FX. “The risk-off environment triggered by the Brexit decision raises the likelihood of a policy response by Japanese authorities,” argued HSBC economist Izumi Devalier in a note to clients last Friday. 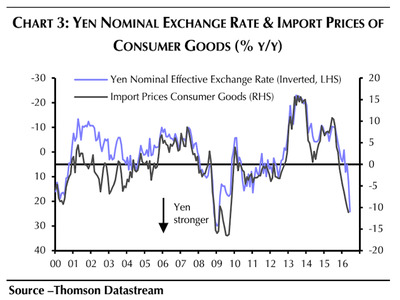 Still, even if the authorities move to respond to the stronger yen, it may not be enough. 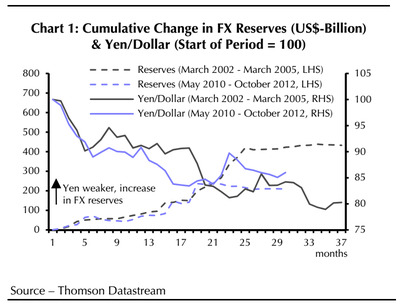 Thieliant also shared the a chart showing two periods of major FX intervention by Japan. 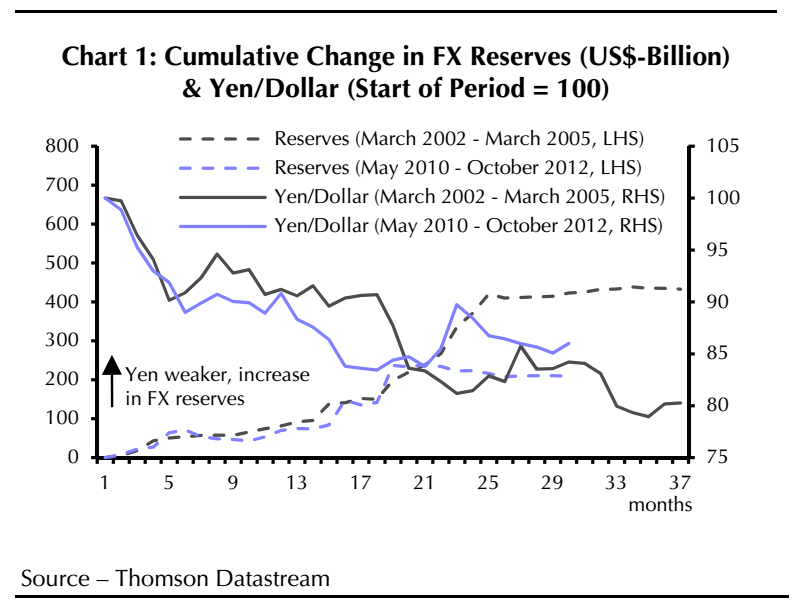 For what it’s worth, the yen kept appreciating in both cases — despite foreign currency purchases. For what it’s worth, another extreme possibility that has been floated for Japan has been “helicopter money” — although some are still sceptical that the bank would go for that. Still, the bottom line is that investor’s dive into the yen following the Brexit vote has put Japan into an awkward position — and it’s going to be interesting to see what they do next.